We are very excited to announce an upcoming conference taking place at Brown University and The Rhode Island School of Design in Providence, Rhode Island from May 6-8 on the topic of "Lost Museums." Speakers will include Morbid Anatomy Museum creative director Joanna Ebenstein with "Notes on a Speculative Recreation of the Lost Cabinet of Dutch Anatomist, Moralist, Museologist and Artist Frederik Ruysch; UCL's Petra Lange-Berndt with "Pedagogy of the Ruin: Mark Dion’s Academy of Things, Dresden 2014; former Coney Island Museum director Aaron Beebe on "Enthusiasm, Wonder, and “Stuff” in the New Dime Museum;" and a keynote by Rosamund Purcell. Tickets, which appear to be free, can be found here. Details and full schedule follow; you can find out more here. Hope very much to see you there! Held in conjunction with the year-long exhibition project on Brown’s lost Jenks Museum, the symposium addresses the history of museums from a new direction: not their founding, but their disappearance. We know a great deal about how museums are born and how new collections come into being, but not nearly enough about how these fragile institutions pass out of existence, how artifacts decay and disappear as times and interests change. What happens to a collection when once-prized objects are no longer seem valuable? Or when ethical standards shift, as in the movement to repatriate cultural artifacts to the peoples or nations from which they were taken? How and why are specimens and artifacts deaccessioned or traded away? How do changing ideas about the evidentiary, educational, and research values of artifacts affect what seems worth saving? How do wars, natural disasters, and other cataclysmic events shape collections and impact institutions of heritage, preservation, memory, and knowledge production? What can we learn from museums that have been forgotten and then revived in a new cultural context? Is permanence a virtue, or might we embrace notions of ephemerality in museums? Following is a guest post by Evan Michelson, Morbid Anatomy Library scholar in residence and star of TV's Oddities. Here, she tells the fascinating story of "George's Arms" (seen above), her contribution to our current Collector's Cabinet exhibition, which closes March 29th. You can see Evan speak in person about objects in her collection at our closing party on March 29th, on which more here; you can also purchase a full color, illustrated exhibition catalog with texts written by the collectors (only eight dollars!) here. 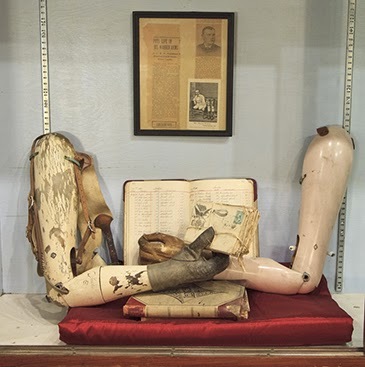 Antique and vintage prosthetics are uncanny, beautiful objects. They are almost always anonymous, whatever stories they have to tell being limited (at best) to a name inked or carved into the wood. This particular pair of prosthetic arms, however, comes not just with a name, but with an inspiring tale of survival, courage and human resilience. They belonged to Mr. George Hunlock of Danville, PA, a brakeman for the Delaware, Lackawanna and Western Railroad. The railroad carried both freight (primarily coal) and passengers along a busy route from Pennsylvania to upstate New York. These arms date to the turn of the 20th century, but Mr. Hunlock’s horrific accident occurred a bit earlier, sometime in the 1880s. At that time, George Hunlock’s job as railroad brakeman was one of the most dangerous jobs in the world. In the early days of the railroad brakes had to be gradually, manually engaged on each individual car. This meant that the brakeman had to jump from car to car on the roof of a moving train (often braving the bitter cold and dangerous, icy conditions). On freight lines the brakeman usually rode in an open cabin on the outside of the car; sometimes he simply clung to a ladder, or even rode on the roof. In the summer the brakeman baked in the sun, in the winter he froze in snow and ice. When it rained, he was drenched. It was dirty, exhausting work. The brakes were engaged using heavy wheels or levers; it was a gradual process that involved repeated trips back-and-forth along the length of the train. It was not uncommon for brakemen to be mangled or killed on the job (one early report estimated that 10 brakemen died every day in the US in the performance of their duties). Brakemen were very poorly paid, and the job was often allotted to the illiterate and uneducated (presumably because such people were considered to be the most expendable). In the 19th century the railroad companies were shielded from lawsuits, and the costs associated with injury were often not compensated: even if a brakeman survived his accident, his family was still facing financial ruin. There is no detailed record of the accident itself, but George Hunlock (like so many before him) apparently slipped underneath a moving railroad car, and his arms were crushed (or possibly severed altogether). Such an accident would be catastrophic today, but in the late 19th century survival itself would have seemed nearly miraculous. Antiseptics, anesthesia and the sterilization of instruments in surgical amputations were still relatively primitive procedures, and pain killers were opiate derivatives that eventually caused addiction. Mr. Hunlock undoubtedly benefitted, however, from advancements made during the recently-concluded American Civil War, which had brought about a revolution in the science of limb amputation. George's prosthetic arms were found at a house sale many years ago, packed in a wooden box labeled “Dad’s Arms.” They were accompanied by newspaper articles detailing Mr. Hunlock’s bravery. Also in the box was all his correspondence with the limb manufacturers, and a stack of old ledgers (signed “George Hunlock”) from George’s second career as a tobacconist. The account books contain neat, precise handwriting that span several years. The dealer who bought the arms was told by a family member that the writing (incredibly enough) is George’s very own. 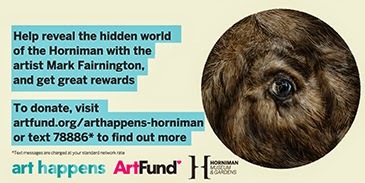 Help Artist Mark Fairnington Reveal the Horniman Museum’s Hidden World! Our friend Jo Hatton--Natural History keeper at London's excellent Horniman Musuem--has just alerted me to a wonderful looking project they are attempting to fund via Kickstarter. Your support will also win you a number of lovely rewards including art prints and photo books. 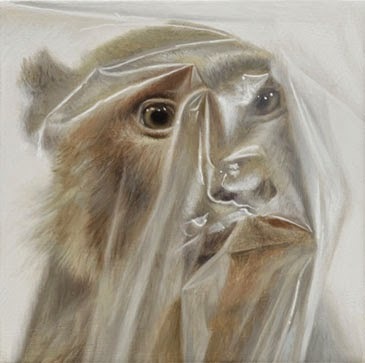 Following is a description of the project; for more information, visit the Horniman's Art Fund page, Twitter feed, or website. Please consider supporting this unique and worthwhile project! We want to stage an exhibition of Mark Fairnington's paintings alongside their inspiration, our collection's hidden taxidermy treasures. 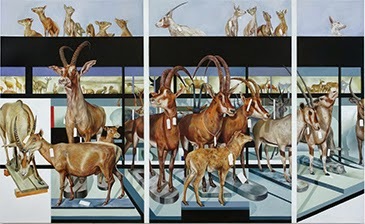 We need your help to fund Mark Fairnington’s autumn exhibition at the Horniman Museum and Gardens, where we will display his paintings alongside the specimens that inspired them. The objects will be presented as they are in storage, evoking the wonder Mark experienced when he found them for the first time. 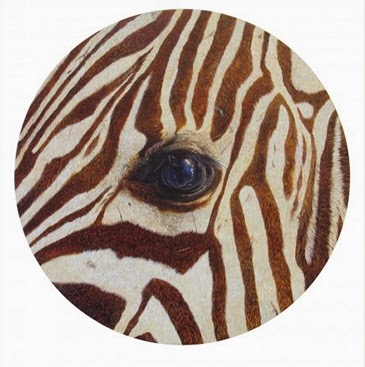 Mark Fairnington is a British painter whose work explores the lineage of animal and plant painting, and its relation to how humans understand the natural world. He has been exploring the natural history specimens at the Horniman over the past five years; looking into hidden spaces in our collection and painting the objects he has found. Like many museums, most of our collection is not on public display – thousands of objects are kept boxed and wrapped in storage. These storage depots are full of peculiar, breathtaking and surreal images: taxidermy specimens wrapped in transparent plastic sheets, skeletons perched in wooden boxes, a small pet dog lying in a nest of tissue paper. Please help us raise the money so that we can show you more of Mark’s stunning work and reveal the secrets of the Horniman store. In return for your donation, you will receive one of a number of wonderful rewards. These include limited-edition postcards, prints and bags, as well as a chance to meet Mark behind the scenes. Mark Fairnington has shown extensively in museums and private galleries in the US and Europe. 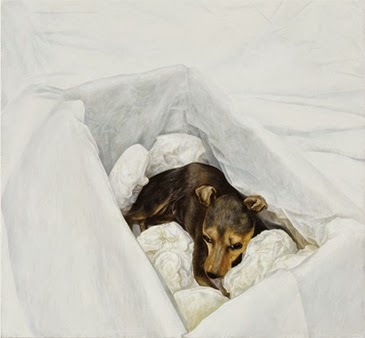 His practice is founded on painting as a primary method of research, and his pictures – which are drawn from many sources, particularly photography – combine obsessive surface detail with sensuous precision. They examine how painting, as a meticulously constructed surface, can interrogate and re-present an image. The subjects of Fairnington’s paintings are made more singular through being painted. He has worked with the Imperial War Museum, the Natural History Museum, the Horniman Museum and Gardens and the Wellcome Collection. Fairnington’s most recent solo exhibition Unnatural History was a retrospective at the Mannheimer Kunstverein and Galerie Peter Zimmermann in Germany. Below, film maker in residence Ronni Thomas--director of The Midnight Archive--explains his attraction to 18th century phantasmagoria magic lantern shows, as explored in his first "Morbid Anatomy Presents" film, starring Mervyn Heard, author, of Phantasmagoria: The Secret Life of the Magic Lantern. You can view the film above; Stay tuned for more episodes which will premiere monthly on our new You Tube channel, which can be found here! P.S. Happy Birthday, Mervyn Heard! It may surprise you (though it doesn't surprise me), that our ancestors were as addicted to terrifying themselves as we are here in the "enlightened" age. In this film, Mervyn Heard, a historian of the 'Magic Lantern', tells us about the Phantasmagoria shows of the early 1800s. Our 200 year old ancestors would subject themselves to total darkness, floating skeletons and demons, drugs, electrical stimuli and many more sensory abuses, all for a cheap thrill. Preceding cinema by almost 100 years and serving as some of the earliest form of stage magic, the Phantasmagoria shows set out to not only bewilder audiences, but to terrify them, and in big style. Why do we consistently seek out ways to put ourselves through some sort of existential hell? Perhaps, the thrill of fear, is a necessary part of our emotional evolution... Or, perhaps we just like a good scare! The film is the first of the new Morbid Anatomy Museum Presents film series.